Situated in Oberharz am Brocken, this property is 0.7 mi (1.1 km) from Pullman City Harz and within 6 mi (10 km) of St. Salvator Church and Rappbodetalsperre. Baumannshöhle - Rübeländer Stalagmite Cellars and Grenzlandschaft and Museum Sorge are also within 9 mi (15 km). Situated in Oberharz am Brocken, this property is 0.8 mi (1.3 km) from Pullman City Harz and within 6 mi (10 km) of St. Salvator Church and Rappbodetalsperre. Baumannshöhle - Rübeländer Stalagmite Cellars and Grenzlandschaft and Museum Sorge are also within 9 mi (15 km). Situated in a rural location, this property is 1 mi (1.6 km) from Pullman City Harz and within 6 mi (10 km) of St. Salvator Church and Rappbodetalsperre. Baumannshöhle - Rübeländer Stalagmite Cellars and Grenzlandschaft and Museum Sorge are also within 9 mi (15 km). Situated in Oberharz am Brocken, this property is 1.1 mi (1.7 km) from Pullman City Harz and within 6 mi (10 km) of St. Salvator Church and Rappbodetalsperre. Grenzlandschaft and Museum Sorge and Baumannshöhle - Rübeländer Stalagmite Cellars are also within 9 mi (15 km). Situated in Oberharz am Brocken, this vacation home is 1.5 mi (2.4 km) from Pullman City Harz and 3 mi (4.8 km) from St. Salvator Church. Rappbodetalsperre and Grenzlandschaft and Museum Sorge are also within 9 mi (15 km). Situated in Oberharz am Brocken, this vacation home is 1.4 mi (2.3 km) from Pullman City Harz and 3.1 mi (4.9 km) from St. Salvator Church. South Harz Nature Park and Rappbodetalsperre are also within 6 mi (10 km). Situated in Oberharz am Brocken, this vacation home is 1.6 mi (2.5 km) from Pullman City Harz and 2.8 mi (4.4 km) from St. Salvator Church. Rappbodetalsperre and South Harz Nature Park are also within 9 mi (15 km). Situated in Oberharz am Brocken, this vacation home is 2.3 mi (3.7 km) from Pullman City Harz and within 6 mi (10 km) of St. Salvator Church and South Harz Nature Park. Rappbodetalsperre and Grenzlandschaft and Museum Sorge are also within 9 mi (15 km). Situated in Oberharz am Brocken, this vacation home is within 9 mi (15 km) of Pullman City Harz, St. Salvator Church, and Rappbodetalsperre. South Harz Nature Park and Museum Kleines Bürgerhaus are also within 12 mi (20 km). 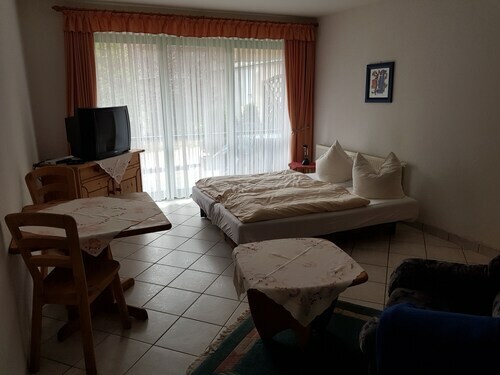 Apartment "zur Alten Stellmacherei" - Apartment "zur Alten Wheelwright"
Situated in a rural location, this property is within 6 mi (10 km) of Pullman City Harz, South Harz Nature Park, and St. Salvator Church. Rappbodetalsperre and Grenzlandschaft and Museum Sorge are also within 12 mi (20 km). You're bound to have a good experience when you visit Pullman City Harz. You'll discover it in Oberharz am Brocken, which is 50 miles (80 kilometers) outside of the state capital, Erfurt. Though there's just 1 accommodation option here, how many beds does one really require? The Hotel-Restaurant Druidenstein is 4 miles (6 kilometers) away from Pullman City Harz. Pullman City Biker Ranch (Rosentalstraße 1, Hasselfelde) is 0.1 miles (0.2 kilometers) away, and is the perfect option when you want to feast on some of your favorite dishes at a reputable eatery. St. Salvator Church is a peaceful house of worship and a local attraction that you might like to check out. If you are interested in natural beauty, plan a trip to Bode Gorge. Hiking trails and many photo opportunities can be found here, so be sure to pack a snack and take some pictures! Head to Blankenburg Castle. This well-known historic castle is certain to hold the attention of the entire family. Rosstrappe has some truly impressive cliffs. Inject some culture into your vacation by attending a play at Harzer Bergtheater. How Much is a Hotel Room in Pullman City Harz? Hotels in Pullman City Harz start at $62 per night. Prices and availability subject to change. Additional terms may apply.